One of the more popular Early American quilt styles was called the "Album " or "Friendship" quilts. Often created for a special occasion, such as a marriage, a birth, or a new home, each individual patch of the finished quilt was typically made by a different woman. Many times messages of good will, blessings, and greetings were incorporated into each individual square. Just such quilts inspired these tiles. CLICK HERE FOR "HOW TO ORDER"
Or ..... Please CALL US!! We are happy to help you on the phone!! 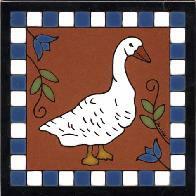 SHOWN BELOW ARE FOUR OF OUR "SPECIAL EDITION TILES"
#199/8 Goose Design 8" x 8" Special Edition $63.95 each FREE SHIPPING** BEAUTIFULLY GIFT BOXED!! 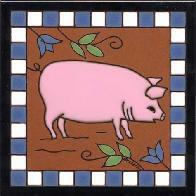 #200/8 Pig Design 8" x 8" Special Edition $63.95 each FREE SHIPPING** BEAUTIFULLY GIFT BOXED!! 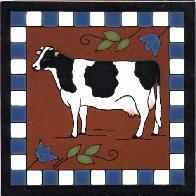 #210/8 Cow Design 8" x 8" Special Edition $63.95 each FREE SHIPPING** BEAUTIFULLY GIFT BOXED!! 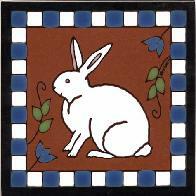 #212 Rabbit Design 8" x 8" Special Edition $63.95 each FREE SHIPPING** BEAUTIFULLY GIFT BOXED! !